The working title for this post has been “What Might Be Working when It Looks Like Nothing is Working.” I plan to throw out some numbers that are insignificant not by their values, but because they really do not tell the story of the experience (insert a groan from me every time someone talks about “data telling stories”). And this is less a recap of an experience that is way too big to fit in a post. I wrote in mid December about the early planning stages in which we had our introductory video. See more summary of the videos as well as how I intended from the start to make crappy videos on purpose. Oh, that is 10 videos we made that is 1:15:52 in duration. That’s 635 views, and our viewership dropped from 223 in the first video rather linearly to my usual video audience of 14. Ouch. Do i care? Heck no. And on January 6, 2015 when we put it in motion. And for those who like to know whats under the hood, learn about the building of the site. Heck I should have listed all the You Show related posts. On the web site we had 49 blogs signed up to the syndication hub contributing 403 posts. Paltry? Well if you just look at numbers. If you read the highlighted ones, maybe a different story. Of those 403 posts, 103 were from external participants. Low number? Well considering we did not have rigorous assignments or regular events for the open folks, pretty good. If you look at numbers, you miss the gems by Joe Murphy or from Sheila Stagner. If you put three drops of water in my glass, I will tell you how nearly full it is. I set up a Martin Hawksey Twitter Tags archive for #youshow15. In the summary sheet I count 1085 tweets that shared 767 links. Of course I had 326 of them between my personal account and the @youshow15 one (and the latter are mostly the automated ones that went out for the Daily Challenges). And I must again hand out a rating of FIVE Youshow Retweets for our colleague from Portugal @idabrandao, who did many of the Daily Challenges but also shared a boat load of resources with us via twitter. Muito obrigado, Ida! 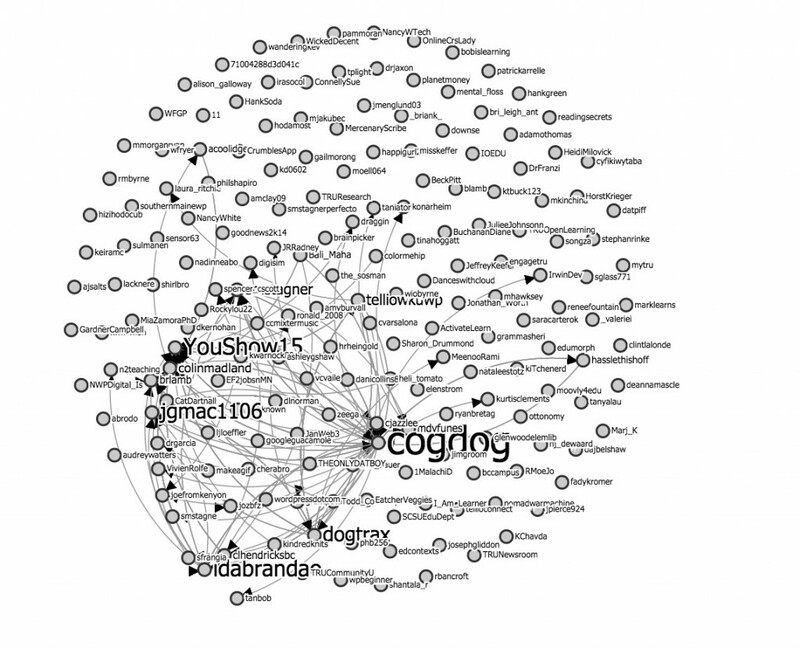 According to general laws of twitter physics, the conversation explorer (a mapping of connections between people tweeting to the hag tag) there is a Death Star shape with a few active folks and cloudy of orbiting bodies. We published 51 Daily Challenges using for the first time a SPLOT developed version of the ds106 Daily create re-crafted as a WordPress Theme. In this new version, responses are tweeted to a dedicated account. Apparently I did not impress Tom sufficiently as he is developing his own flavor (I am joking Tom, I know the reason is you need to roll into an existing theme, I AM NOT HURT12). There were 126 responses to the 51 challenges giving us a mean Fargwick Flare Factor of 5.2. Yeah, data and statistics. Tannis Morgan from the Justice Institute of BC did a demo of her unit’s WordPress projects (yikes, I seemed to have missed creating an event page), but this one was a key influence on the development of the MOVE project (see below). Tannis also killed it her role in episode 5 of our video as The Consultant from Vancouver who sent the hosts to wardrobe and the tech dorks in the booth got sent for coffee. We also had a handful of open drop in sessions, more in the first weeks as people were finding their way with blogging platforms, plus some later (archived) sessions on audio- Creating Sound Effect stories and Making a Single Sound Composition. I did individual “Blog Makeover: visits with five people, two of which I have archived recordings. Alana has made incredible leaps as a first time (I think) WordPress builder. She took right to the use of images (especially GIFs) but also developed a blog personality in her writing, with humor, wit and commentary- and her talk through of the frustrations of working in WordPress are the best kinds of stories to read (on the other side of the frustration). And she has taken a strong lead on the MOVE project, something evolved out of the participation of her and colleagues at the Centre for Student Engagement and Learning Innovation. They are growing the capacity to be able to do their own web projects. Colin has crafted a professional portfolio of beauty and design, working his way through a premium theme that is rich in media. He has written too many thoughtful reflective posts to list here. The energy that Gail and Joseph put into their Audio Sound Effect stories, which we included in Episode 6 of the video. They went beyond their limits of skills to learn audio editing and not only learn the mechanics, but how to create compelling creative works with just sound. I spent two or three sessions with Loretta helping her design and setup a blog she will use for your evaluation report. It’s private so you cannot see it, but we came up with a structure that is more comprehendible than pages of tables and charts, plus she will be able to link in her evidence with documents and media. Now she just needs to stop saying her site is boring. Franzi has crafted a visually pleasing and thoughtful professional portfolio. She started from not knowing much about creating a blog to having a site I hope she is proud of. We had a few coaching sessions, and while I was skeptical about the Twenty Fourteen WordPress theme, we were able to shape it to something she feels positive about. Jon has been a fantastic colleague with helping us on the latter videos but he has also written up fantastic “making of” / “behind the scenes” looks into his work in video and audio. We did not get in enough trips to Red Beard! Rob was a regular attendee of our sessions, but kept making excuses for not starting his blog (just kidding Rob). He really enjoys writing, and what made things click for him, I think, was in a few one on one sessions where we got his blog set up with a theme that is focused on the presentation of written stories. He has been on fire since then, I see new stories almost every few days. A lesson for me was finding the ways that he really was interested in working on, rather than trying to make him do audio or write reflective posts. This is kind of a running summary and I am positive I am missing a lot of anecdotes. This has been an amazing run and I am thankful TRU was willing to try a very flaky idea. The numbers in scale are insignificant. The friendships, the personal growth, a willingness of folks here to embrace some radical ideas, the time spent visiting people in their offices, the anecdotes are not seen in the numbers.